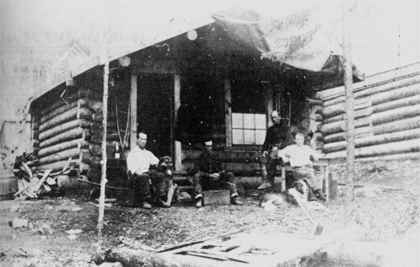 The photograph above shows Marshall and Louis Bond's cabin in Dawson City. Jack's tent was pitched next to this cabin during his short stay there. The Bond's dog Jack, who became "Buck" of "Call of the Wild" is at the left. The two dogs we took into the Klondike with us were fine specimens. One of them in particular had characteristics of such fine excellence as to be called character. He had a courage that, though unagressive, was unyeilding; a kindness and good nature that the most urbane man in the world might have observed with profit, and a willngness to do his work, and an untiring energy in carrying it out. I have had too much loyalty and affection from dogs to doubt that they have souls if men have them. Lndon liked these dogs, and particularly this one which I called Jack. His manner of dealing with dogs was different from anyone I knew, and I remarked it at the time with interest. Most people, including myself, pat caress, and talk in more or less affectionate terms to a dog. London did none of this. He always spoke and acted towards the dog as if he recognized it's noble qualities, respected them, but took them as a matter of course. It always seemed to me that he gave more to the dog than we did, for he gave understanding. He had an appreciative and instant eye and he honored them in a dog as he would in a man. During the winter I was busily engaged in mining on Eldorado Creek and saw London only occasionally. He went on several sled trips to locate claims in remoter districts, and observed and drank in the life about him. Prior to the Klondike experience he had two large adventures in life. While still a boy he had been a tramp and hoboed it about the country gaining the point of view of, and developing great sympathy with, this element. Then he had served as a seaman on a sailing schooner off Japan and in the Bering Sea. He was still a youth in his early twenties. From a monetary point of view his experience in the Klondike was profitless. Outside of the rare piece of luck which occasionally leads a man to set his stakes on a bonanza piece of ground, mining success calls for kowledge of the subject and a certain, if not decided business faculty. London lacked both. He had the misfortune to develop scurvy, and left on a down river boat in the early summer, paying his passage, I believe, by as much work as was possible in his condition. His home at that time was but a small affair and scantily furnished. The room in which he worked contained a desk, a typewriter, and behind his chair in easy reach were the works of Herbert Spencer, Huxley, Darwin, and other authors. "I had to first read all these," he explained "to get a basic knowledge for writing." "Does writing pay, Jack?" I asked with the frankness of friendship. "He answered "I came out of the Klondike broke, found that my father had died and left some debts. I have paid up everything and am supporting three families. * The first year I never got a thing accepted, and I began to get morbid and believe that I got turned down because I was a socialist. I now wonder how the first stuff that was finally accepted ever got by. But it is hard work. He who waits for the muse to move him will never get anywhere. I write five thousand words a day to discipline and command myself. Much of it has to be torn up, but I make myself write it. Robert Louis Stevenson said that there eventually comes a feeling of great exaltation when a man realizes that he is the master of his tools. I hope for that moment. System and precision characterized his work. Newspaper clippings, articles from magazines and all data he wished to preserve were neatly bound in folders, labelled and filed handy for use. He was a tremendous worker, and an orderly one. He also visited me at my home in Santa Clara, and his description of the place is the beginning of "The Call of the Wild." Later when he had become recognized as an author of distinction he was sought after by many people of social prominence in and around San Francisco. Once I chaffed him about being a social butterfly. He replied: "That side of life had been denied me, and when I began to be asked to the houses of prominent people I went to broaden my experience, and because I believed it a complment to my efforts as an author. I was soondisillusioned by the discovery that I was merely being used as an advertising medium or possible feature of interest for other people's social functions. My last hostess held almost no conversation with me, her time being entirely taken up with another woman. in mutual recitation of the notables they had met abroad. I think I have learned all that is neccessary from such experiences and have cut them out." During the last years of his life, after he had become a worldwide author, I regret that I never saw him. I should like to have as personal recollections the man in his maturity with all the added wealth to his virile mind that came from work, rich experiences and notable success. During his period of development the man was leonine in courage, brilliant in speech, loyal, and independent. The impression lasts over all these years that "Here was a man". *The three households mentioned were his mother, his wife and Jennie Prentice an educated and cultured black woman. This last figure is often forgotten as an influence on Jack's development. She is also sometimes referred to as his nursemaid when in fact she looked after him mostly for free and had more money than Mrs London. One of her relatives a sea captain was the one who persuaded Jack to go to sea. It is ironic that someone who wrote papers criticizing Blacks, Jews and Greeks both accepted and defended them as individuals. Jennie was black Anna Maloof was Arab and Greek, Anna Strunsky was Jewish. Likewise his male friends came in every description. As a half black I sometimes have to defend him against critics who fail to grasp his complexity.